In early 2009, the Center for the Future of Museums hosted a webcast lecture by Jane McGonigal on Gaming and the Future of Museums. The gist of the presentation was that given the amount of time folks, particularly the youth, invest in playing online games, how could museums tap into this trend to further their mission? A load of archaeological sites host games of varying quality. The Society for American Archaeology’s Fun for all Ages lists some game pages. Mr. Donn provides a whole suite of archaeological online games from the very simple to the reasonably complex At Colonial Williamsburg the Dirt Detective is a very simple and straightforward educational attempt. 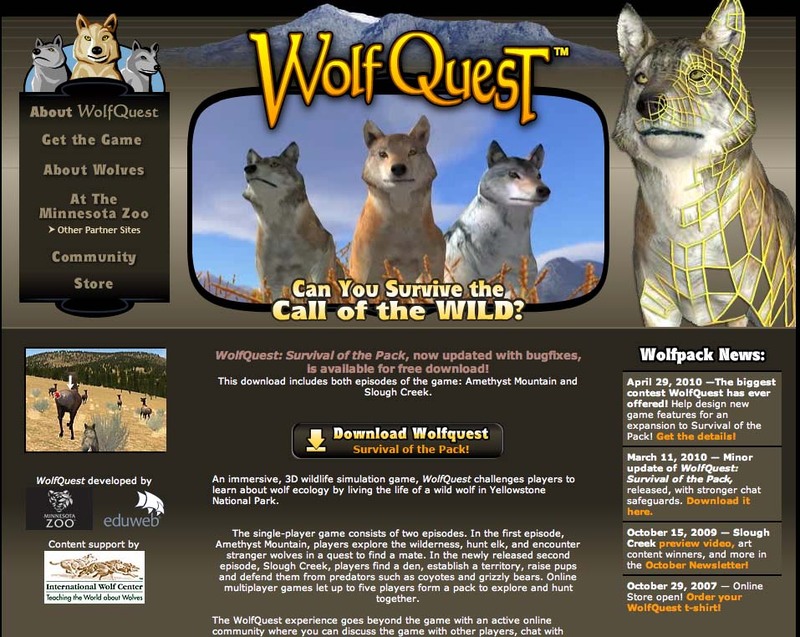 Wolf Quest is available in both Mac and PC formats and provides an action game environment with education on wolf ecology. Players track scents, mate, and pretty much do just about everything a wolf does during its life cycle. Although I am not an expert on wolf biology, the game appears authentic and does not rely on glitz to keep the player engaged. I cannot imagine playing at this game for a bit and not coming away considerably more knowledgable about wolves – and it’s a free download. The McCord Museum in Montreal provides historic era gaming options to online visitors. McCord uses an increasingly popular option for museums in online gaming that allows the visitor to “tag” items on display to develop more reliable and robust keyword searches. The McCord Museum games also include role-playing, observation, and quiz type games. Overall, the McCord Museum offerings are quite engaging and provide a considerable information on the historic era Montreal and interacts with their broader on-line presence. For example, the quiz game includes an image of an Iroquois headdress, ultimately connecting to the digital collections catalogue containing 40 odd other headdresses curated by the Museum. Less complex than Wolf Quest, McCord-type offerings can be created through basic Dreamweaver programming skills. Perhaps the most low-tech but ultimately the most community engaging gaming is the recently launched Interrobang a joint project of Nuvana, Microsoft, and the Smithsonian. Interrobang is geared toward K-12 grades who choose real-time missions from those listed on the Interrobang site. In collaboration with other team members, players develop a plan to achieve the mission. The team then performs the mission, uploads documentation to the website and describes the experience. Missions are regularly added to the Interrobang website and include Trash Reincarnated where players visit a recycling center and gather information on the recycle process from curbside bin to ultimate reuse. In State of Song players create, perform, and video document songs to teach the names, capitals, and features of U.S. states. Teams receive points for each completed mission along with badges and listing of team scores on the web page. Interrobang gaming is aimed at problem solving. The on-line presence is quite low-tech and manageable with a minimum of digital experience. It’s not clear how successful Interrobang has been during its brief lifespan, however, the content seems completely in-line with McGonigal’s approach to on-line gaming and museums. What is your experience with on-line gaming, archaeology, and museums?